How to find the perimeter of a polygon? With this perimeter of a polygon calculator, you'll quickly calculate - surprise, surprise - the perimeter of a regular polygon. To avoid confusion, we present the easiest option, where all you need to do is choose the polygon type and enter its side length. 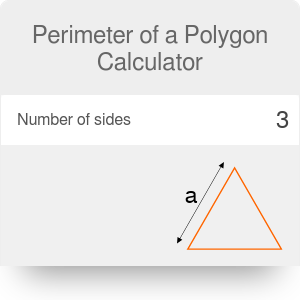 Other formulas that determine the perimeter of a polygon exist, too - you can use our general polygon calculator to find the polygon perimeter from other parameters. Pick the polygon type. Let's suppose we want to calculate the perimeter of an octagon. Type the number of sides. We've chosen the other... option, so we need to enter the number of sides manually. It's 8. Enter the side length. Assume it's 17 in. Voilà! The perimeter of a polygon calculator shows the result. The perimeter of such an octagon is equal to 136 in. Now that you know how to find the perimeter of a polygon, maybe you're curious how to calculate its area? Then check out our area of a polygon calculator. Perimeter of a Polygon Calculator can be embedded on your website to enrich the content you wrote and make it easier for your visitors to understand your message.